Finally got around to the centerpiece of my Flesh Eater Courts army…the behemoth known as a Terrorgheist. Fortunately, I’m taking part in a painting challenge called ‘Jewel of July’ where we choose a centerpiece model for any given collection of models hobbyist are working on. This big batty fella fit the bill for me as I had been putting it off and needed the push to get it done. 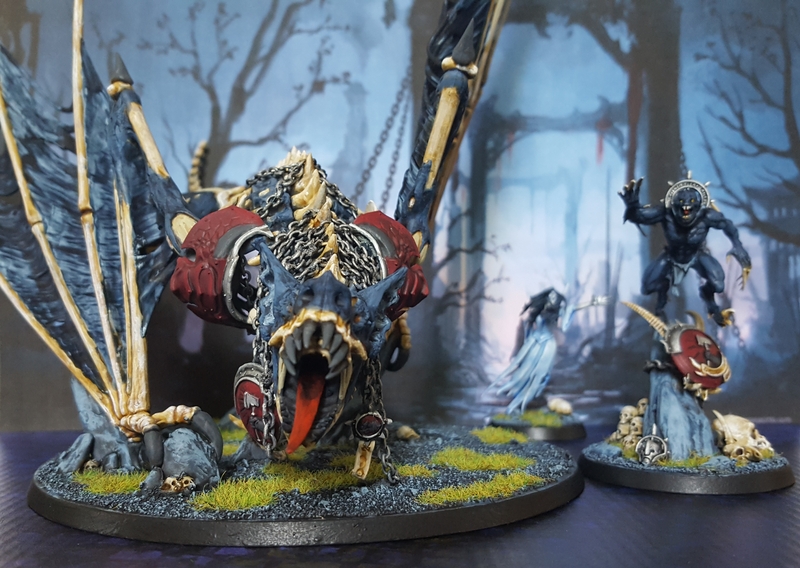 As with the rest of my Flesh Eater Courts army, The Chamber of the Bloodied Dawn, I wanted it to appear Stormcast Eternal inspired. I struggled with what I could do with this model, but came up a local individual who had some spare Dracothian Guard chest plates. 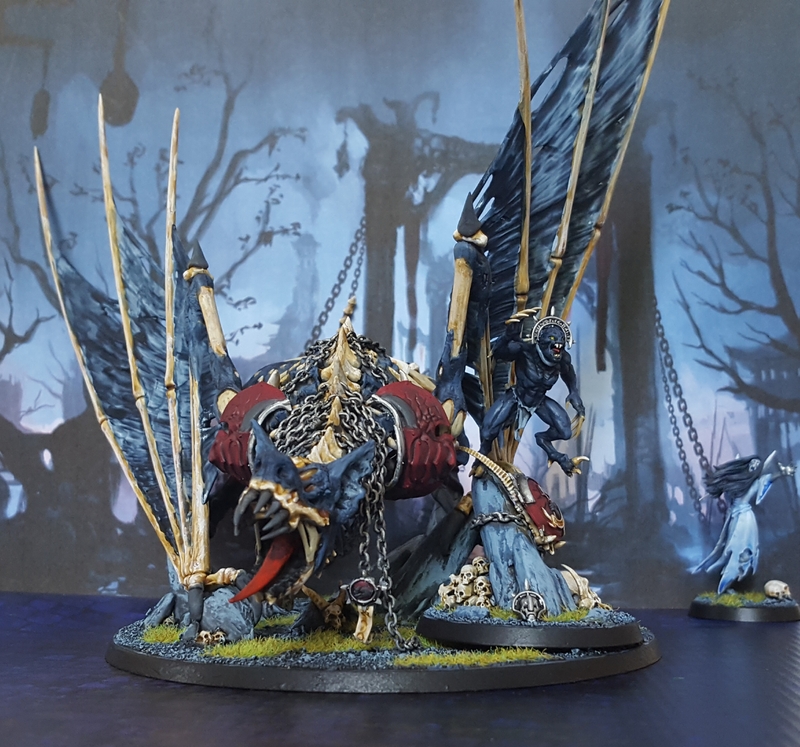 The creatures neck was too low to have them hanging from it and they wouldn’t be seen if they were protecting his torso as they do for the Stormcast mounts, so these became shoulder guards. To get some more iconography on the creature I wrapped a series of chains around its neck which hang a shield and medallion with seal. I see Lord Maulheart and Co tossing these chains around it’s neck ceremoniously prior to battle. 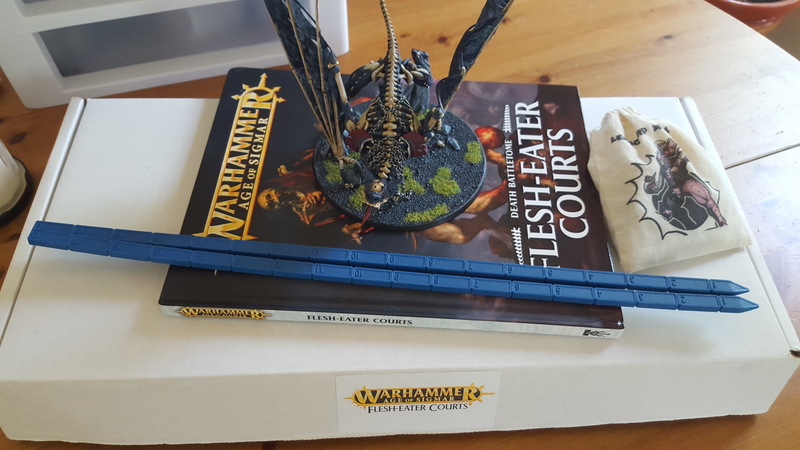 Flesh Eater Courts can be designed with the Ghoul King either on foot or riding on the Terrorgheist. 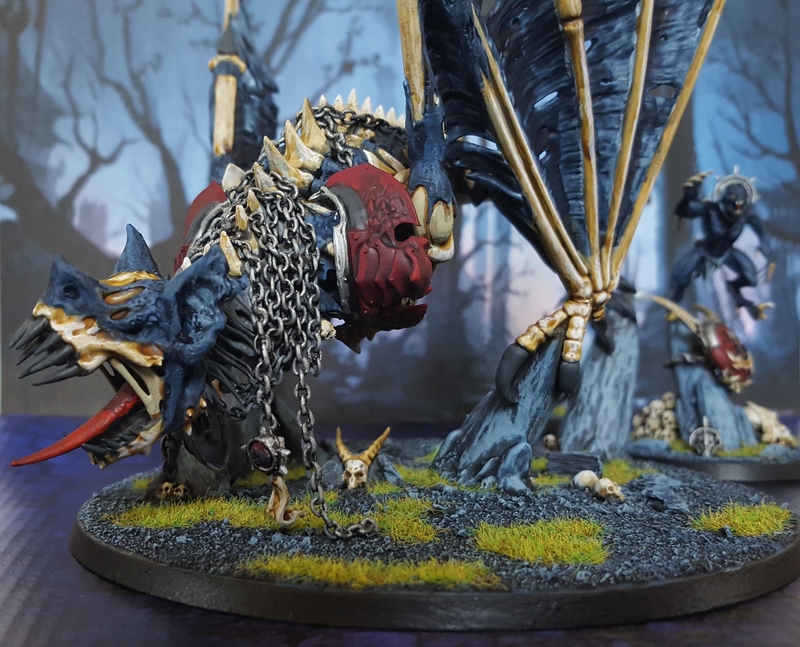 To account for this flexibility, I moved the model a little to one side of the base, angled a wing up pretty high, and created room to also put the Ghoul King on so I can have them together as one model in cases where I build the army with Lord Maulheart riding his mount. To be honest, I struggled with assembly of this creature. I found it pretty difficult getting all the rocks that it’s perched on to glue level on the base. Those struggles paled in comparison to how much trouble I had painting the beast. Painting this model really tested my patience with the hobby side of this…hobby. In the end, it doesn’t look too bad. There are definitely some spots I’ll go back and try too smooth up, but for now he’s sealed and ready to game. 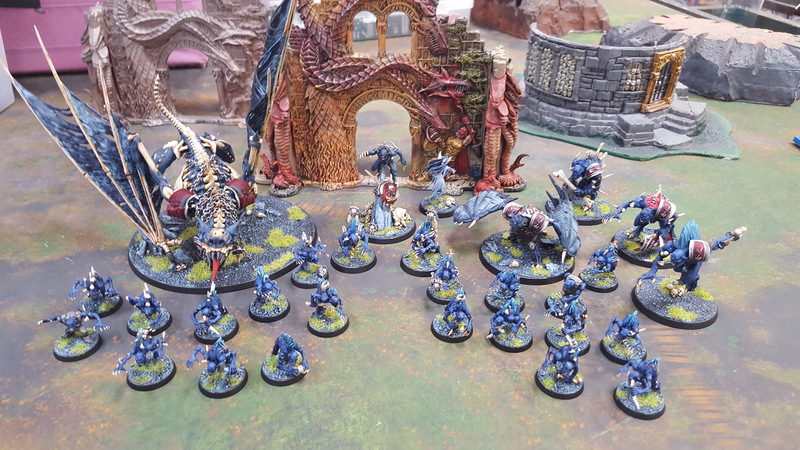 In fact, I took the army out for a test run yesterday against a Nighthaunt army led by Nagash’s Bride. Lord Maulheart’s Chamber was routed…but he lived to to restore order to the Mortal Realms another day. The next issue with this creature is…how the hell do I store it? 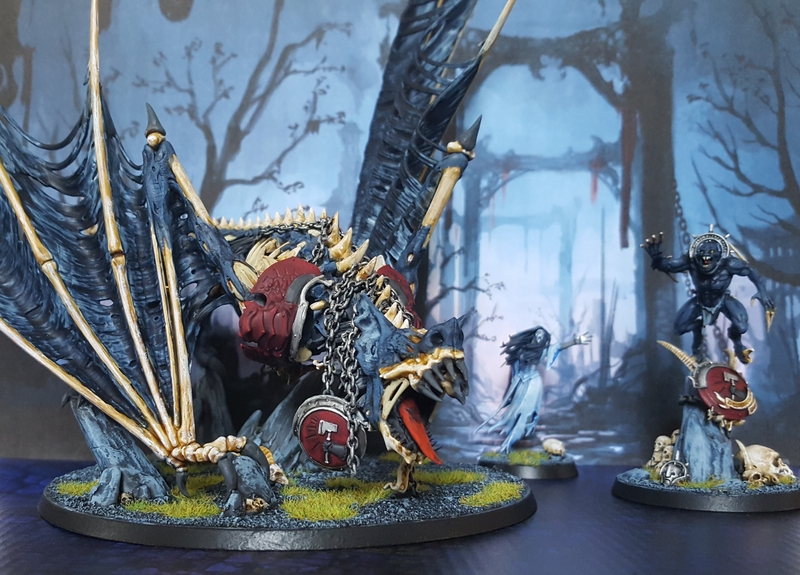 This entry was posted in Age of Sigmar, Conversions and tagged Age of Sigmar, Games Workshop, Miniatures, tabletop wargames, Warhammer by Mr. White. Bookmark the permalink. That’s quite a beast! It looks fantastic! That big chap is a very nice centrepiece, good work. Your trials with the building and painting were worth it for the excellent end result. This will for sure make a fitting offering for Azazel’s Jewel of July challenge. Thanks. I’ve gone back and forth on the teeth/claw colors. Bone is the obvious choice, but I was thinking the dark grey would allow the red tongue to ‘pop’ out more. I dunno. I’ll keep it as is for now.